Tag 3 bloggers to answer these same questions. Those bloggers will TAG 3 more bloggers of their choice with the same questions & rules. 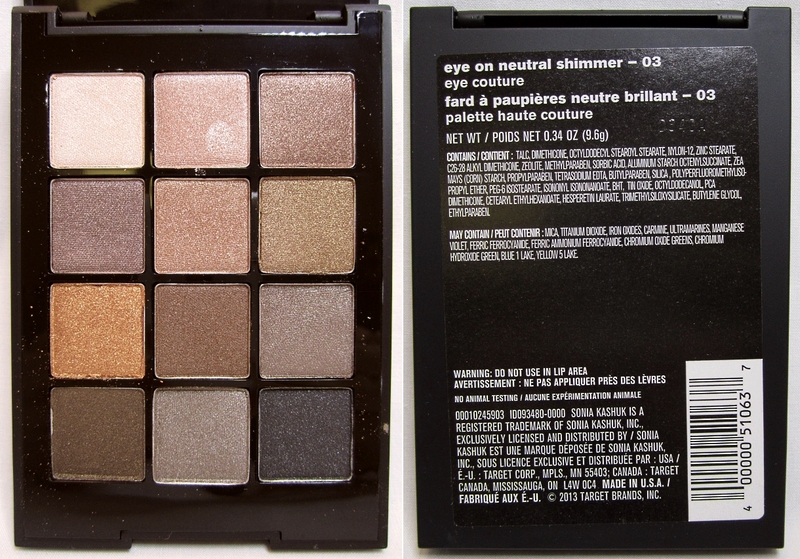 Yet another Targetgate™ item up for review, the Sonia Kashuk eye on neutral shimmer 03 eye shadow palette ($20 Target). I originally was on the hunt for the all matte version of this palette but since they were all sold out, I settled for the shimmer one. The palette contains 12 individual shadows of 0.8g each for a total of 9.6g. The shades range from a light champagne to a deep smokey charcoal. The palette is aptly named as the neutral palette as it has a blend of warm and cool shades but overall, the palette is neutral. The palette came completely shrink wrapped but for some reason there’s a smudge mark on the middle pan, top row.